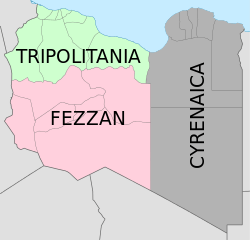 Fezzan was a governorate within both Italian Libya and the Kingdom of Libya, 1927-1963. Fezzan (Berber: ⴼⴻⵣⵣⴰⵏ, Arabic: فزان‎‎ Fizzān, Turkish: Fizan, Latin: Phasania) or Phazania is the southwestern region of modern Libya. It is largely desert, but broken by mountains, uplands, and dry river valleys (wadis) in the north, where oases enable ancient towns and villages to survive deep in the otherwise inhospitable Sahara Desert. The term originally applied to the land beyond the coastal strip of Africa proconsularis, including the Nafusa and extending west of modern Libya over Ouargla and Illizi. 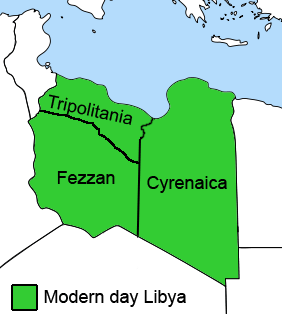 As these Berber areas came to be associated with the regions of Tripoli, Cirta or Algiers, the name was increasingly applied to the arid areas south of Tripolitania. In Tamazight (Berber language), Fezzan (or ifezzan) means "rough rocks". Fezzan could also be a derivation from the region's Latin name Phasania or Phazania, which may mean "the country of the pheasants" or be related to the Biblical name Phut. Fezzan is crossed in the north by the Ash-Shati Valley (Wadi Al Shatii) and in the west by the Wadi Irawan. These two areas, along with portions of the Tibesti Mountains crossing the Chadian border and a sprinkling of remote oases and border posts, are the only parts of the Fezzan able to support settled populations. 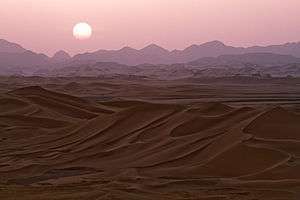 The large dune seas known as ergs of the Idehan Ubari and the Idehan Murzuq cover much of the remaining land of Fezzan. From the 5th century BCE to the 5th century CE, Fezzan was home to the Garamantian Empire, a state which operated the Trans-Saharan trade routes successively between Carthage and the Roman Empire in North Africa and Sahelian states of west and central Africa. The Roman generals Septimus Flaccus in 19 BCE and Suetonius Paulinus in 50 CE led small-scale military expeditions into the northern reaches of the Sahara, and the Roman explorer Julius Maternus traveled there in early 1st century CE. Paulinus reached Fezzan and went further south. For two–three centuries after this invasion, Fezzan, as part of the Garamantes State, was a client state of the Roman Empire and benefited from Roman civilization. With the end of the Roman Empire and the following commercial crisis, Fezzan began to lose importance. The population was greatly reduced due to the desertification process of the Sahara during the early Middle Ages. During the 13th and 14th centuries, portions of Fezzan were part of the Kanem Empire. Wars against the Kanem Bornu Empire in the early sixteenth century led to the founding of the Awlad Muhammad dynasty, with Murzuk becoming the capital of Fezzan. Around 1565 it was ruled by Muhammad ibn al-Muntasir. The Ottoman rulers of North Africa asserted their control over the region in the 17th century. In the reign of Abdulhamid II (1876–1909) Fizan was used as a place of political exile for Young Turks because it was the most remote province from Istanbul. Beginning in 1911, Fezzan was occupied by Italy. However, Italy's control of the region was precarious until at least 1923, with the rise of the Italian Fascist regime. The Italians were resisted in their early attempts at conquest by tribal Arab adherents to the militant Sanusiya Sufi religious order. The Tuareg clans of the region were only pacified by European expansion shortly before the Second World War, and some of them collaborated with the Italian Army in the North African Campaign. Free French troops occupied Murzuk, a chief town of Fezzan, on 16 January 1943, and proceeded to administer Fezzan with a staff stationed in Sabha, forming the Military Territory of Fezzan-Ghadames. French administration was largely exercised through Fezzan notables of the family of Sayf Al Nasr. Disquieting to the tribes in western Fezzan was the administrative attachment of Ghat, and its surrounding area, to French-ruled Algeria. However, when the French military control ceased in 1951, all of Fezzan became part of the Kingdom of Libya. Fezzan was a stronghold for Libyan leader Muammar Gaddafi through much of the Libyan Civil War, though starting in July, anti-Gaddafi forces began to gain ground, taking control of the region's largest city of Sabha in mid-to-late September. The LF country code (.lf) was reserved "on behalf" of Libya Fezzan (for an "indeterminate period of time") by the International Organization for Standardization (ISO). Fezzan was a province under the Ottoman Turks and Italy, and a province (wilayah) or governorate (muhafazah) of independent Libya (alongside Tripolitania and Cyrenaica) until 1963. 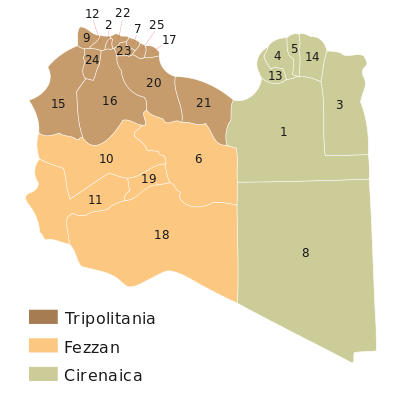 With the introduction of the new administrative division of Libya in 1963, Fezzan was abolished as an independent administrative unit and was divided into the muhafazat (governorates) of Awbari and Sabha. In 1983, these administrative divisions were abolished in favour of smaller districts or baladiyah. The Baladiyat-system was reorganized in 1987 and was replaced in 1995 by the Sha'biyat-system. The former Fezzan province contains the districts (Sha'biyat) of Wadi al Shatii, Wadi al Hayaa, Jufra, Ghadames, Murzuq, Sabha and Ghat (some maps allocate Ghadames to the neighbouring region of Tripolitania). The historic capital, largest city, political and administrative centre is Sabha. The region's inhabitants include the Dawada, the nomadic Tuareg in the southwest, and the Toubou in the southeast. These pastoralist populations often cross the borders of Algeria, Chad and Niger freely. In the north, Arab, Berber and settled Tuareg and Toubou mix. While making up some 30% of the land area of Libya, the Fezzan supports only a small percentage of its population. Large towns like Sabha survive on near-surface water in the wadis of the north and west. The northeast area is dominated by Haruj, a large and unpopulated volcanic field. Fezzan's population has grown rapidly since the mid-20th century along with the overall growth in Libya's population, and the province's share of the national population has increased slightly. Source: Gathered from bulletins of censuses 1964, 1973, 1995, 2006. In Turkish Fizan brings to mind distance. For example, about civil servants Fizan'a sürmek (lit. exile to Fezzan) means to exile someone to the farthest place. Also Fizan kadar uzak means so far as Fezzan; tâ Fizan means so far, farthest. Famous Turkish singer Mustafa Sandal's album Kop begins with the song Pazara kadar and contains the lyrics: Pazara kadar değil, mezara kadar! / Gelirim senle Fizan'a kadar! (lit. Not to the bazaar -or Sunday- until grave! / I would come with you to the Fezzan! The song became very popular at the time of the 2002 FIFA World Cup along with the Turkish National Football Team's success. ↑ Abdel Aziz Tarih Sharaf, "Jughrafia Libia", Munsha’at al Ma’arif, Alexandria, 2nd ed., 1971, pp.232-233. ↑ Présence africaine. Editions du Seuil, 1975; p. 477. ↑ Wedeman, Ben (20 September 2011). "Government forces enter Libya's Sabha, to cheers". CNN. Retrieved 20 September 2011. Wikimedia Commons has media related to Fezzan.